I think I’ve been whining in the wish list and some other posts about how poor I am. I feel poor money wise, but I shall stop complaining. It just that… Oh, well you know! Internet and art magazines are the best places to see beautiful, cool and amazing stuff that you really get cravings for. You need them in your life, even though you really don’t… Or? Sometimes you do need them. Yeah, really. I got some money for art stuff when mom was here (must have whined to her too!) intended for a eyelet tool, but the scrapbook store was closed for summer holiday when I was there so I went to the art supply store instead. It’s very small but has a lot of material that I would love to have. Yes really! I obviously needed these things very much right now. My second jar of Gesso, gold paint (so fun to use it in my art journal! 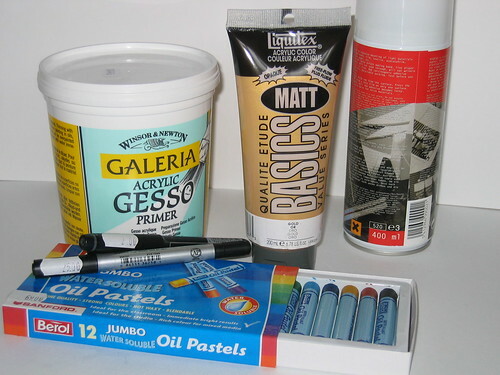 ), spray adhesive, two new black pens and from my own wish list; 12 jumbo water soluble Oil Pastels from Berol. Wooohiii! I’m rich again! They are so fun! # Finally got the fall issue of Cloth Paper Scissors today in the mail, plus money for an article I wrote! Yippie! # Started an altered book this week, glued and gessod some pages yesterday. Wait and see! # Got a letter with roses on it from a close friend. # Dad fixing my flea market reading lamp find with new electric wire! I can see the light! This entry was posted in I write Lists and tagged consumerism, material, music, new material. Bookmark the permalink. You did good — I would say those are all definitely MUST-HAVEs! !